Due to much lower overhead and scale, online banks typically offer much higher interest rates on savings vs. physical banks. Really, the difference is so much that it’s not even a fair comparison. It was true back in January 2006, and it’s still true today. For example, Capital One 360 is offering a 1.00% current savings rate vs. the lower savings rates for my (otherwise AMAZING) local Atlanta credit union*. *If you are an Atlantan, check them out here. Additionally – they are offering a frequently updated 2.00% rate on their money market* savings rate. This is the account where I actually keep my money. It’s in the same dashboard, has the same insurance, and same bank connections. The money is simply legally designated for Capital One to more flexibly lend the money. *Note about Capital One Money Market Savings vs Traditional Savings – ok, I was totally confused about this for a long time. You can really go down the rabbit hole with this. But basically, a Capital One has more flexibility to make money with money in a Money Market account than with money in a savings account. A money market savings account is just as safe and just as insured, but usually has higher minimums and regulators let them loan the money out in overnight money market funds…thus more money for Capital One and more money passed on to you. Either way – both those rates are high-ish. By and large, most banks with physical locations have given up the high-yield savings account market to online banks. The rates they offer are simply too high. That said, there are a ton of online banks (and online-only versions of offline banks). And that is where the real competition and choice is at. The trend that I’ve found over the past 12 years is that the bank with the highest savings rate is never consistent. All banks are bound by market rates on loans (where they put your money to make money), and by the rates they can earn or pay on deposits among other banks or the Federal Reserve. Since all banks make money off that spread, there’ll be a leapfrog & ratchet effect for rates across the board. No one bank will consistently raise their savings rates as mortgage rates go higher. As a consumer, it’s a bit insane to constantly switch bank accounts to get that extra .15% interest rate, especially if you keep your credit frozen. The end goal is to find a bank that offers consistently high rates so that you can just stay and always get a high rate. The main pro of Capital One 360 (and back when it was ING Direct) is that they are consistently right at the top of interest rates for online banks. When I first started with them, they were less than a tenth off the top interest rate (currently at Goldman Sachs). Right now, GS is at 2.25% for their Money Market Savings compared to Capital One’s 2.00% APY. More than I’d want the spread to be – but nowhere near far enough to tempt me to leave, and certainly high enough to sign up with. For whatever reason, banks often act like they live in a completely different universe than other industries. Bank accounts can be an absolute pain to open. However, opening an initial account at Capital One 360 is fairly easy and straightforward (it was when I signed up, and appears to still be so). There’s no account minimums and no faxing or paper trails created. But what’s really useful for me is how easy it is to create new bank accounts once you’re a customer. When you sign up, your customer ID number is different than your bank account number. This setup creates a sort of umbrella account effect where you get to have separate,distinct bank accounts – but manage them from a single online dashboard. It’s a particularly good feature to have if you like to have several different savings accounts – each for a different purpose. You can set up automatic deposits into each and have them very much separate..but all within a single dashboard. Beyond the simple account creation, Capital One 360 doesn’t really have a single killer feature. Instead, it really has quite a minimal interface and feature set that simply…works. They’ve got scheduled deposits, automatic savings plans, emailed tax documents, an easy to use transfer center, and a mobile app for mobile deposits. Nothing is super-amazing, but nothing ever breaks either. They have 24/7 support via email, phone, chat, and even fax. But I have never in 12 years had to contact support. They were one of the first to sync properly with Mint personal finance software (and it still syncs really easily). They also sync well with Personal Capital and YNAB. They have a nifty Access Key so that the software can sync on its own without actually logging in with your credentials and scraping the information. Nothing exciting, but nothing annoying. In my opinion, that’s the way banking should be. Before the Capital One merger, ING Direct was a savings bank only. They did mortgages, but they were really just a savings bank. When Capital One bought up ING Direct, it was part of a play to become a larger, more diversified financial services company. Capital One started out as a credit card company and has bought its way into becoming basically a bank. As part of that move, Capital One has been trying to sync up all their products into one single company. That means that your Capital One 360 savings account will also sync with your Capital One credit cards, Capital One Investing (stock brokerage), and any other Capital One services you use. I have a Capital One Venture Rewards card, and it is informative and useful to have my credit card balances and info right on the same dashboard as my savings account. I don’t have an investment account (I use Vanguard), but if I did, it would be really useful to have my investment information all in one place as well. Syncing up a wide range of products is a good strategy for Capital One. They may start to abuse it, but if they keep it focused on the customer, it’s definitely a pro for signing up with Capital One 360 for anyone with other Capital One accounts. Capital One 360 may always have high rates, but a pretty major con is that the never seem to have the highest rates. As I said in the pros section, banks have an incentive to keep rates as low as possible without tempting you to leave. So at times (like in January when other banks are offering slightly higher than Capital One 360’s 2.00% APY current money market savings rate), it can be hard to tell exactly where the trigger line to switch is. You never really know for sure if you’re being strung along, or if you are getting a good deal overall. As easy as online banking is to set up, it’s still can be a pain to switch bank accounts – especially if you have everything automatically synced up right now. It may be rational to stick with Capital One 360 since they do have consistently high rates. However, it can be a bit annoying and frustrating in a time of overall low interest rates to see such a low rate of return on your account. To see other banks offer higher rates (even if only for a short time) only adds to the grass-is-greener syndrome. Capital One’s growing financial services empire certainly provides convenience to a lot of customers that use their products (as mentioned in the pros section). That said, for customers who don’t use other Capital One products, the constant cross-sells can be annoying. Capital One hasn’t resorted to pop ups and unsolicited emails (yet), but they certainly advertise their other products within Capital One 360. It’s a fine line to walk between offering genuinely good offers to current customers, and pushing unwanted advertisements. And it’s also the flipside of the pro of syncing all your accounts. So far, I’ve been cool with their offers. It hasn’t gotten in the way of the product yet, but for the purposes of a Capital One 360 review – having this tension is a con to consider. In America, we’re stuck with financial plumbing built in the 1970s, which means that often it takes longer for digitized money to move from one bank account to another bank account than it takes for Amazon to ship books via truck from Los Angeles to Atlanta. Moving money online has gotten a bit better since I first opened my account in 2006, but it’s still a major con to using Capital One 360 (or any online bank for that matter). Need to dip into your emergency savings? Better hope you can last 3+ days while the money is transferred to your physical bank’s checking account. In some ways, this con can help you save a bit more by adding an extra hurdle to tapping into savings. It does, however, add an extra layer of planning to your finances. In 12 years, I’ve only had 2 occasions where I really needed emergency savings quickly (a used car purchase over a weekend and a pretty bad miscalculation with my credit card bill). Both situations turned out fine, and would not have been worth switching to the lower interest rate of a physical bank savings account. It was still not particularly fun – and had me wishing I could just walk down to my local bank teller. Either way, between credit cards, better planning, and a bit of a buffer in checking, it is possible to work around the time lag. But until America upgrades its financial plumbing, hurdles to getting your money out will be a con for online banking. Quick aside: Capital One 360 does offer Capital One 360 Checking that attempts to get around this problem. I’ve never seriously considered it, but it’d be worth looking into. If you’re looking for high rates and a straightforward setup for an online savings account, you should check out Capital One 360’s account options here. Bonus recommendation if you’re already a Capital One customer and can sync your other products. If you’re just looking for the absolute highest rates – head over to Yahoo Finance here. Also, if you want the highest rates without FDIC insurance, you can always just buy directly into a Money Market fund via a stockbroker like Vanguard (ie, the place where Capital One makes their extra money with Money Market account money). 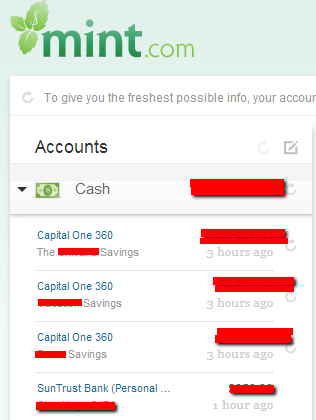 I often use VMMXX as a complement to my Capital One Savings, but it can be a bit confusing…and it’s not insured. Consistently high, but never the highest savings rates. Great setup - but plan around not having emergency access.